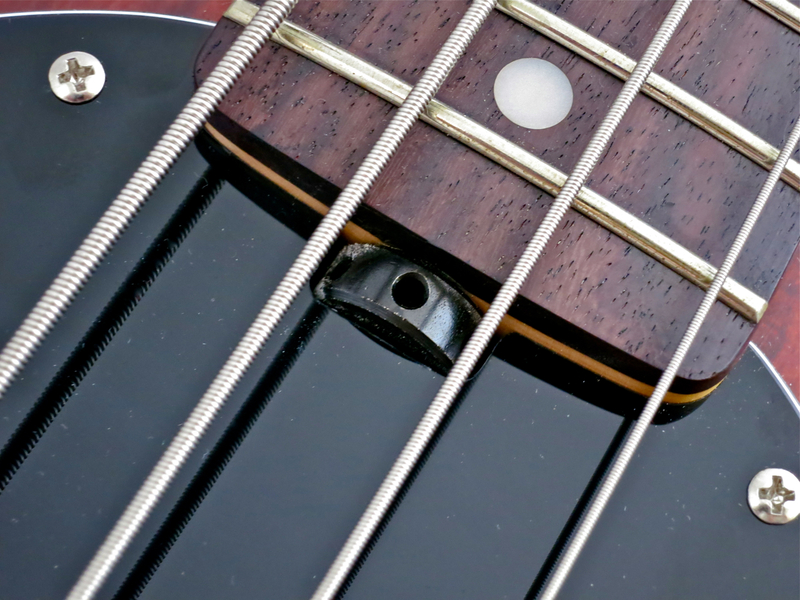 We bassists owe a lot to Mr Leo Fender – Mr Fender was the father of the electric bass, which he introduced in 1951, as well as the man behind three of the most classic bass designs ever. 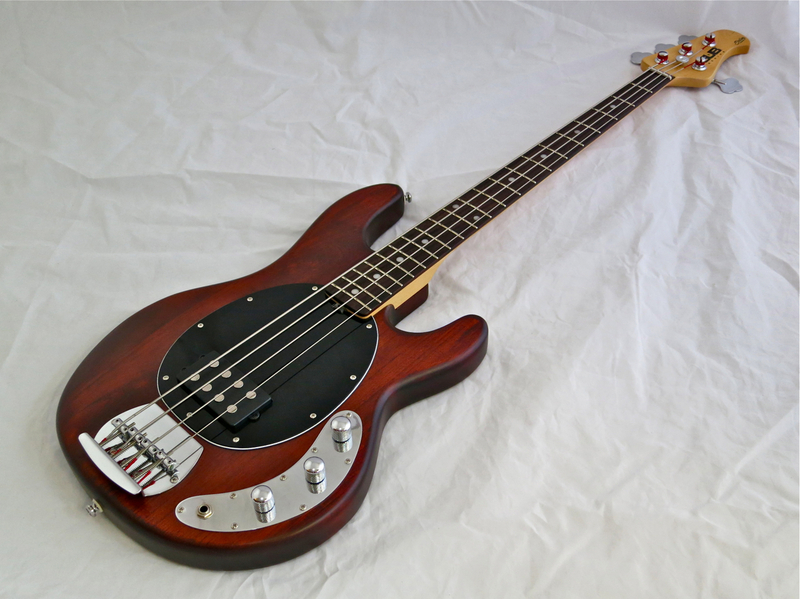 After inventing the Fender Precision and the Jazz Bass for the company that still bears his name, Leo Fender carried on designing and building instruments for Music Man, with the StingRay becoming a true classic. 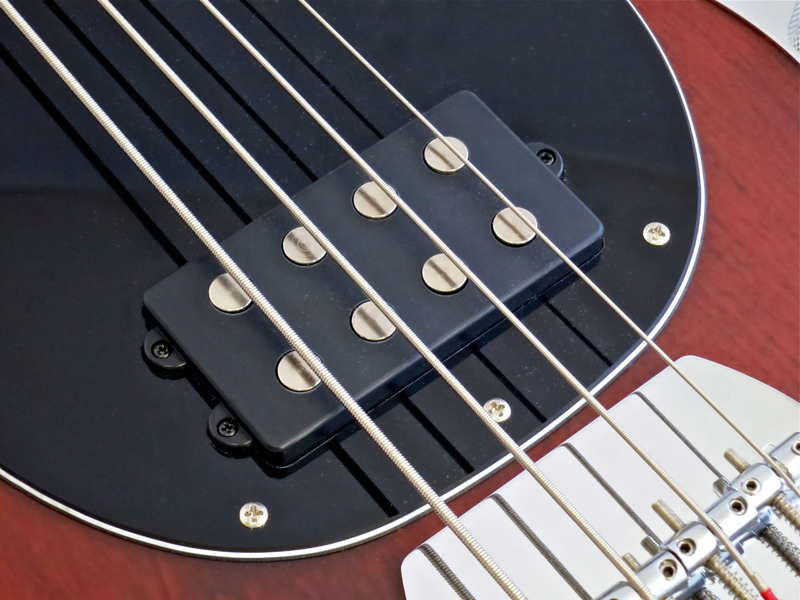 The StingRay wasn’t the first bass with active electronics, yet it was the design that brought the active bass into the mainstream. Since 1984 Music Man is part of the Ernie Ball-company. The company’s current boss – Sterling Ball – is behind the more recent moves to also bring out affordable Music Man-instruments in the guise of a new brand – Sterling (by Music Man). Sterling’s brand-new SUB-series offers even more affordable versions of Music Man’s classics. 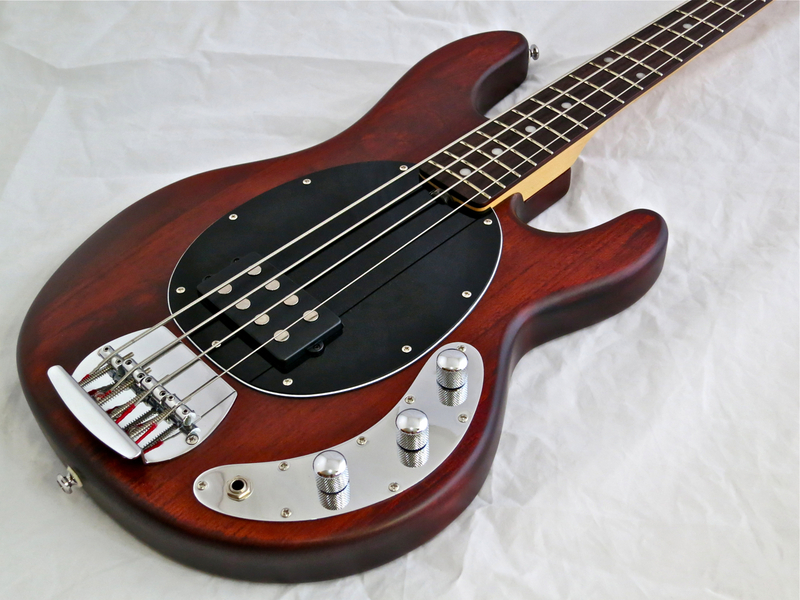 The Sterling SUB Ray4 (approx. 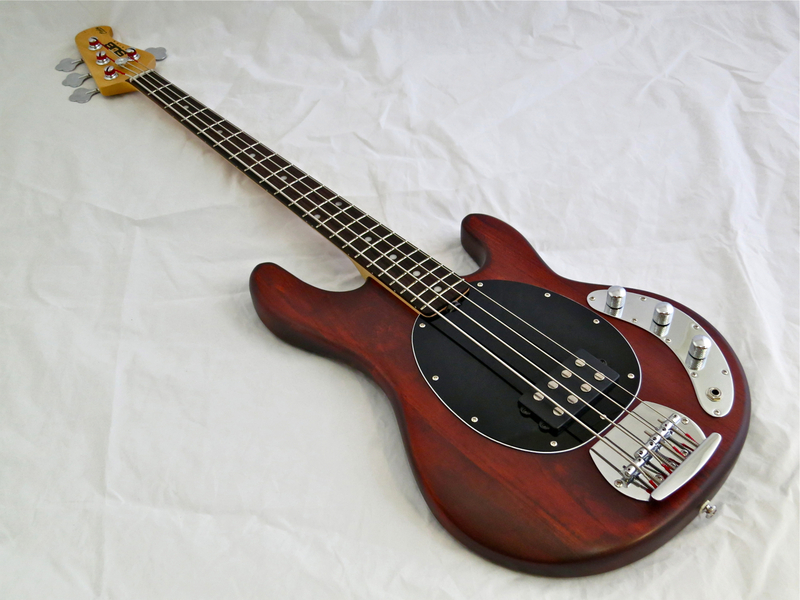 360 €) is a made-in-Indonesia licensed copy of a four-string StingRay. The Ray4 is available either in gloss black (with rosewood fretboard), gloss white (maple ’board) or in a Seventies-inspired satin finish called Walnut (and with a rosewood ’board). Sterling won’t go into detail with regard to the body woods used for the SUB-series – the spec sheet only says ”hardwood body”. 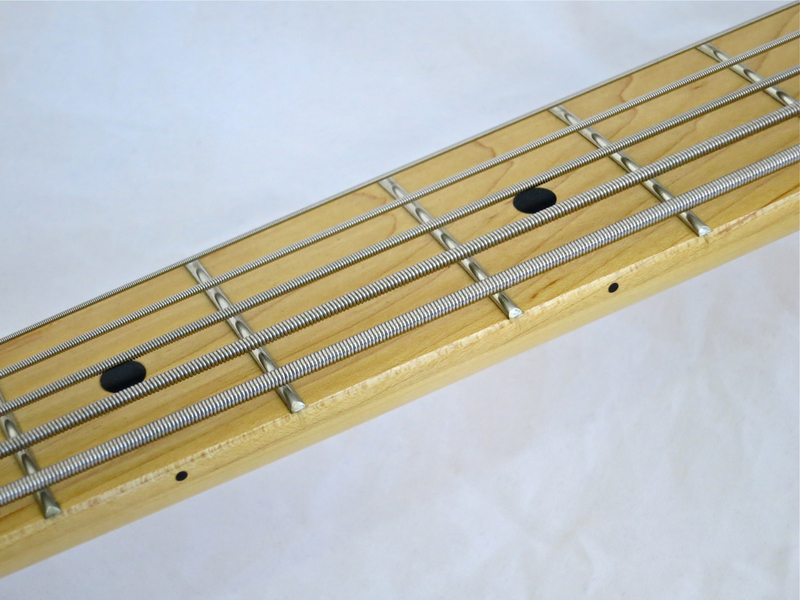 On the other hand, genuine Music Man StingRays also feature different wood species, depending on availability and the respective model’s finish, using ash, alder, poplar or basswood. The test sample sports a body made from four pieces, with their looks matched reasonably well. 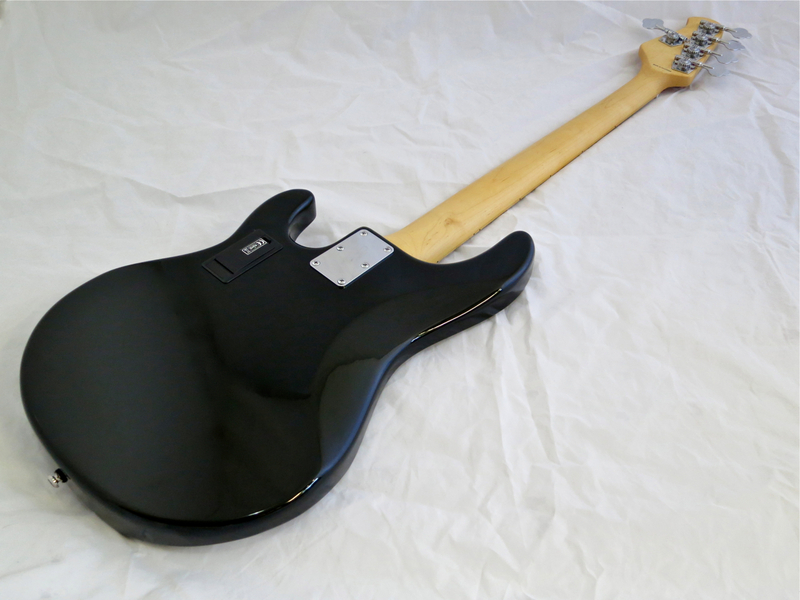 The SUB Ray4’s maple neck comes with a tinted satin finish. Six wood screws and a well-cut neck pocket make for a very strong joint. The classic StingRay-headstock makes tuning easier, as well as cutting down on headstock weight, making for a better balanced instrument. The Sterling comes equipped with a set of decent Asian Schaller-copies. In light of its affordability the SUB Ray4 displays surprisingly well-dressed and finished frets. 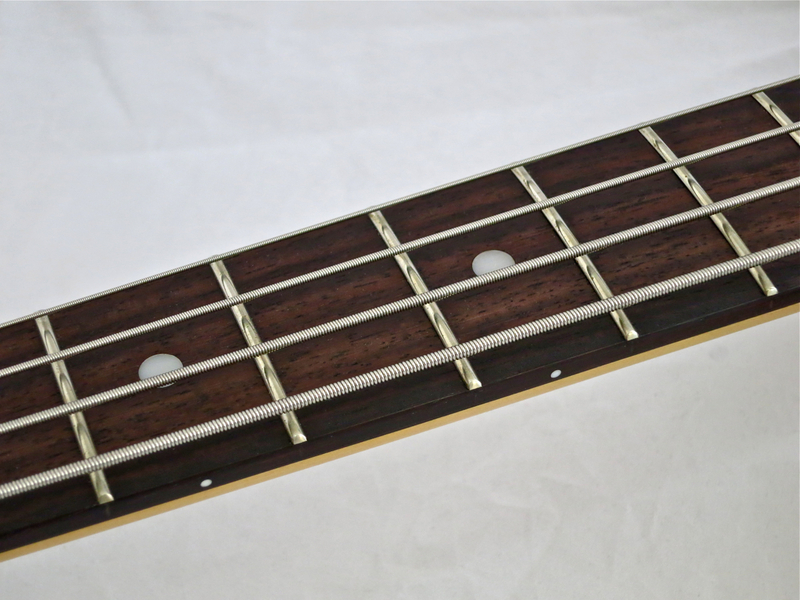 The rosewood fingerboard looks nice and sport clean inlay work. 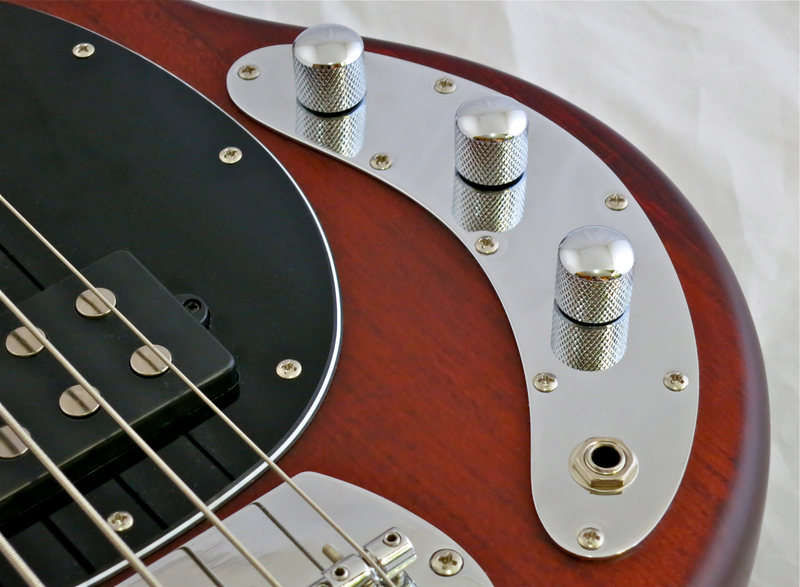 Music Man’s nifty trus rod adjustment wheel has also been included in the Sterling SUB-series. Insert the small metal rod that comes with the bass (or any other suitable object) into the wheel and turn for adjustment. It’s quick, it’s clean, and no further tools are required! 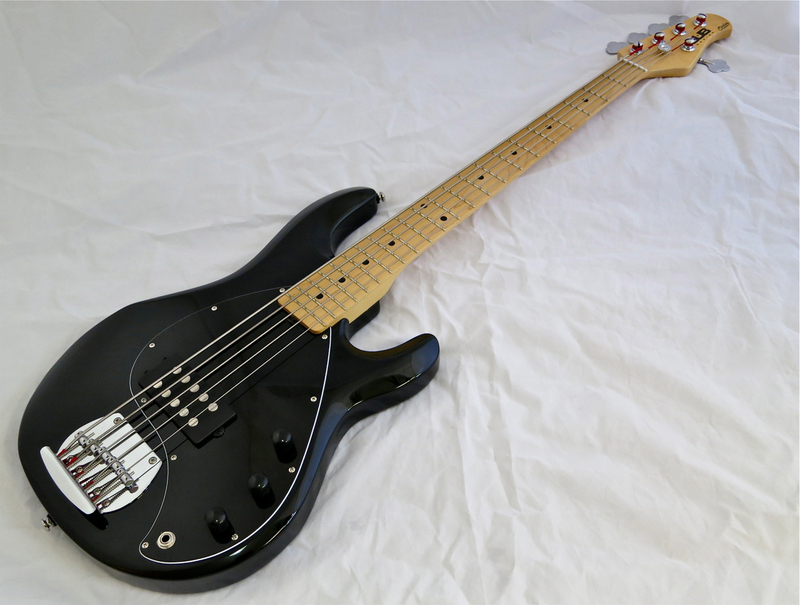 The StingRay was Leo Fender’s updated version of his Precision Bass, and the well-rounded body still looks great today. 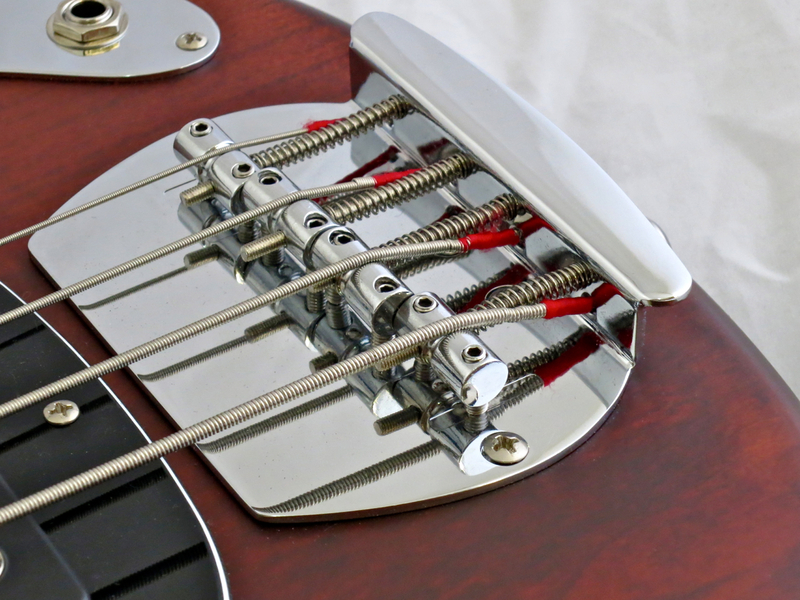 The SUB Ray4 uses a version of the Music Man bass bridge that retains the large base plate, but does away with the original adjustable string mutes of yore. Current StingRays use a shortened bridge design. 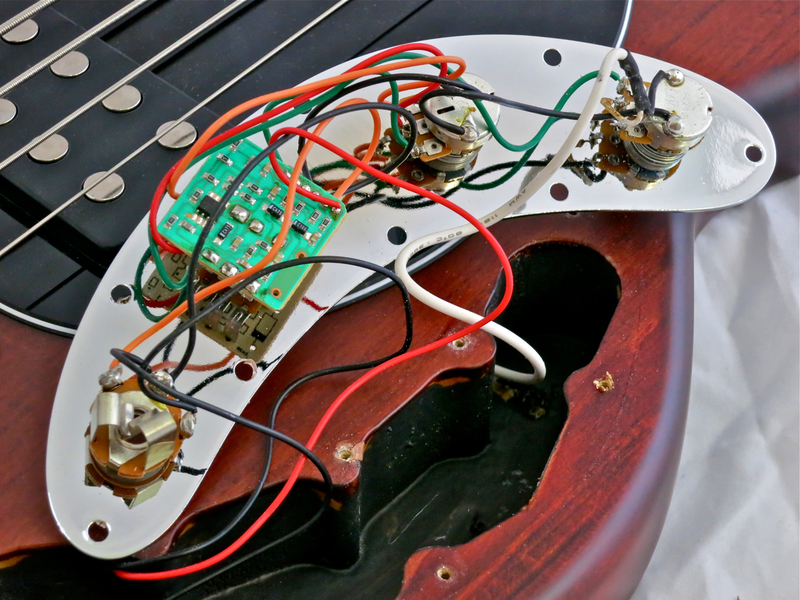 The large humbucking pickup is the Sterling Ray4’s juice machine. 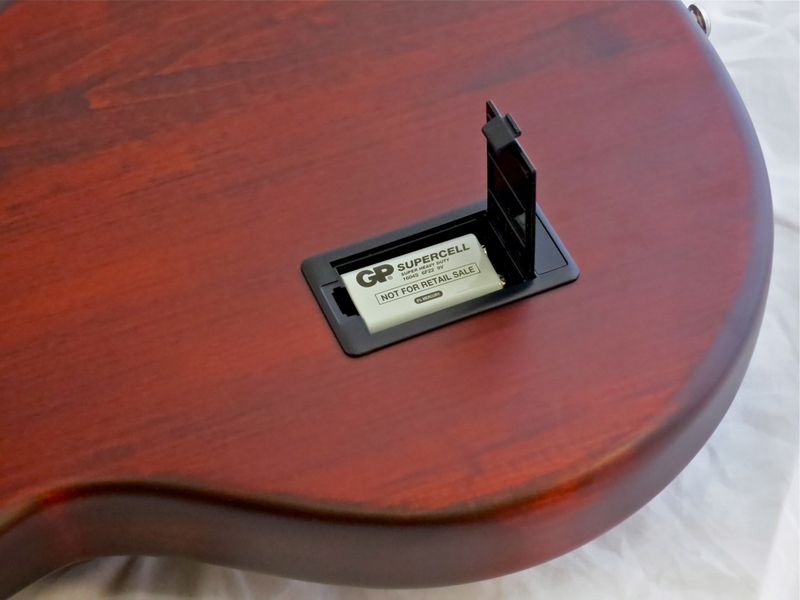 The pickup keeps hum and buzz at bay efficiently, while its placement near the bridge is crucial for obtaining a StingRay’s fat attack and vocal mid-range character. 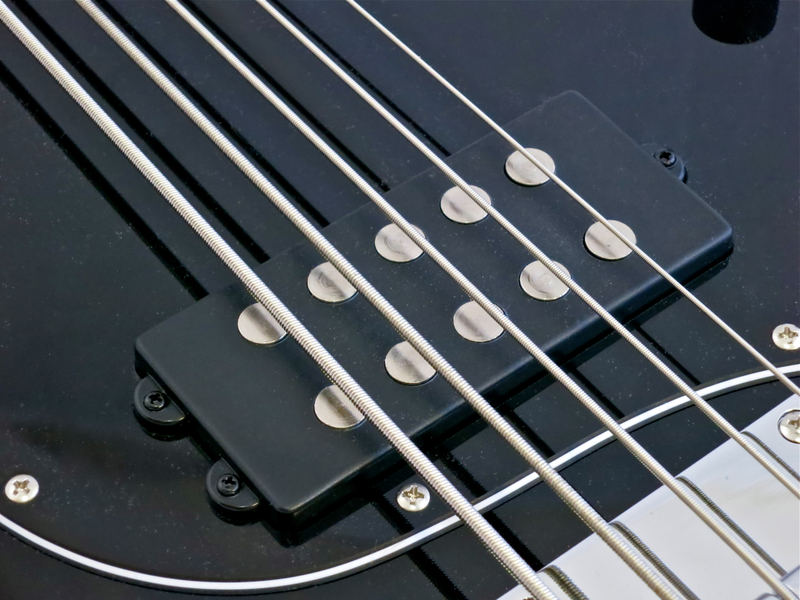 It’s three controls on the Ray4’s metal plate – master volume, treble boost/cut and bass boost/cut. 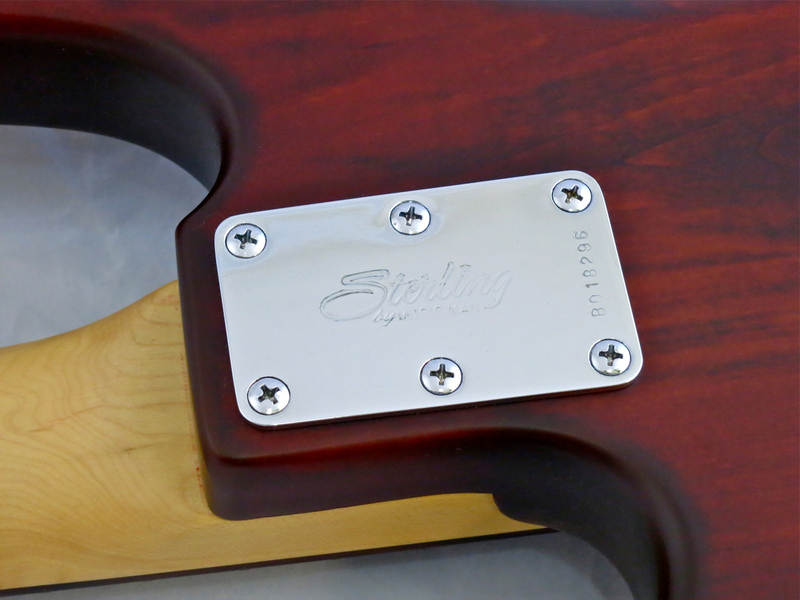 The Sterling SUB-basses come equipped with a very compact preamp that fits easily into the control cavity. The quality of the parts, as well as the workmanship on display, is quite decent. The Ray4’s battery compartment is found on the back of the body. 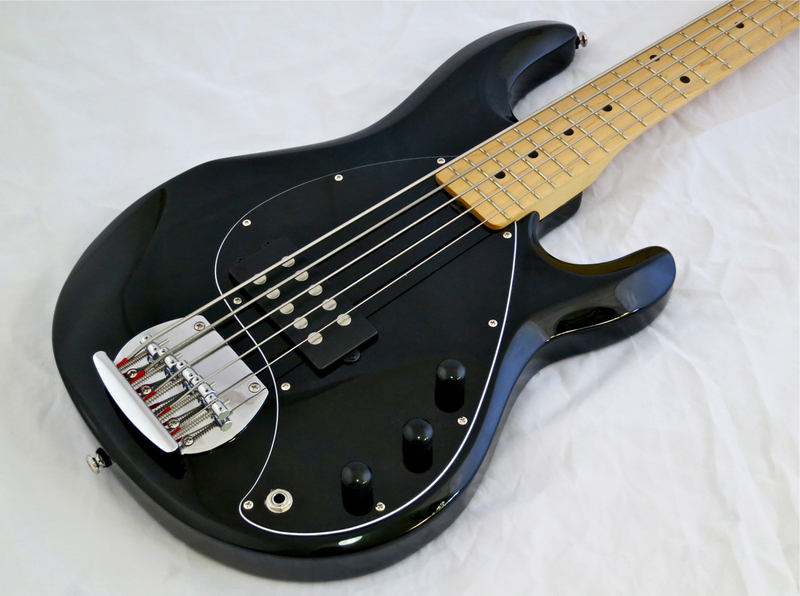 In 1988 Music Man broadened its StingRay-range with the five-string StingRay 5, which features a slightly different body design, as well as a much larger scratchplate. 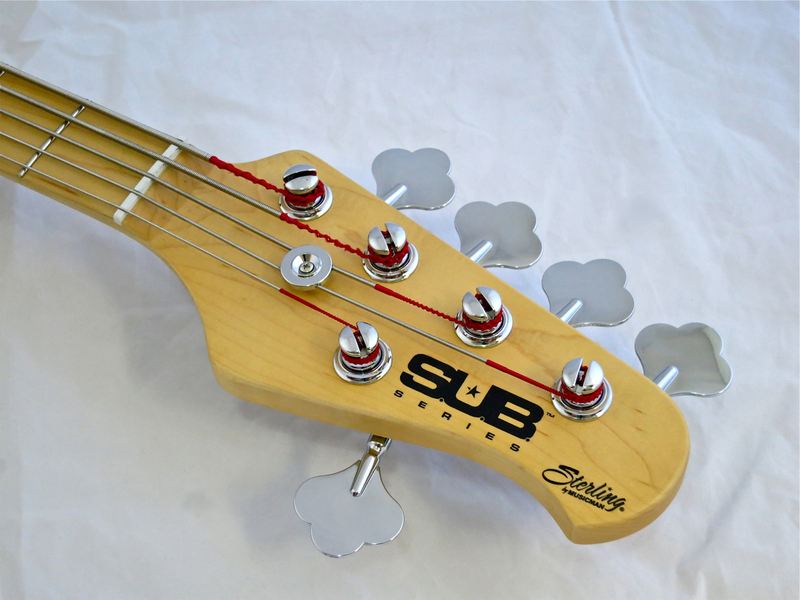 Sterling’s SUB Ray5 (approx. 390 €) is available in gloss black (with a maple fretboard) or satin walnut (rosewood ’board). The finish on our test sample looks great. 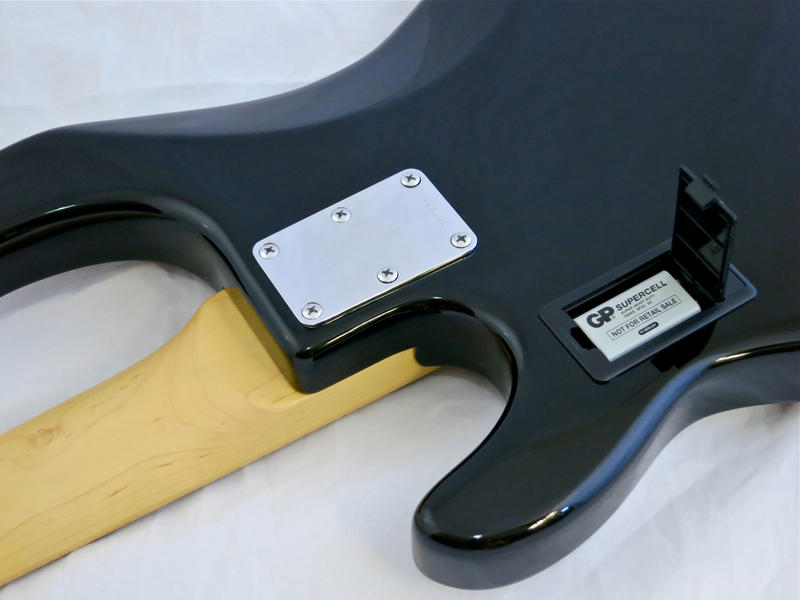 The five-string version also sports a tinted maple neck. The SUB Ray5’s battery compartment has been placed near the treble horn. 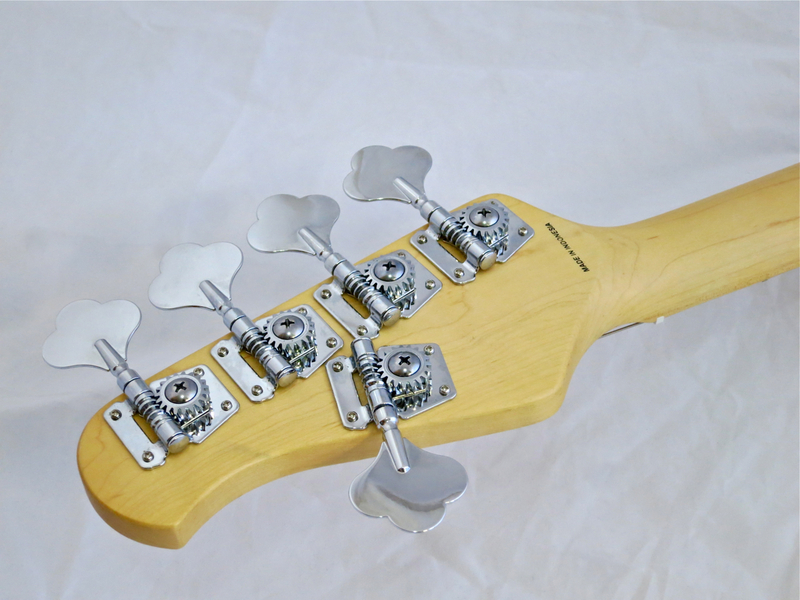 The famous headstock in its five-string guise. These Schaller-copies do a good job of keeping the bass in tune. 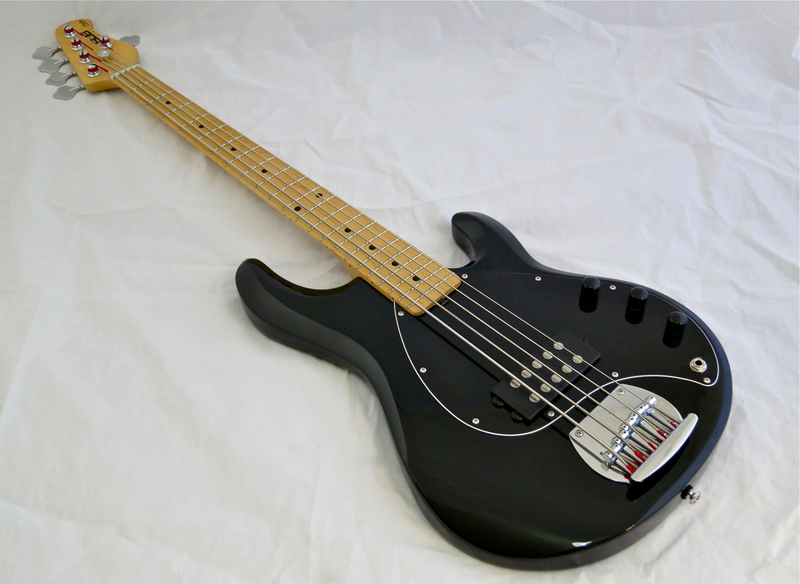 The fretwork Sterling Ray5 is surprisingly good, keeping in mind the bass’ low price. 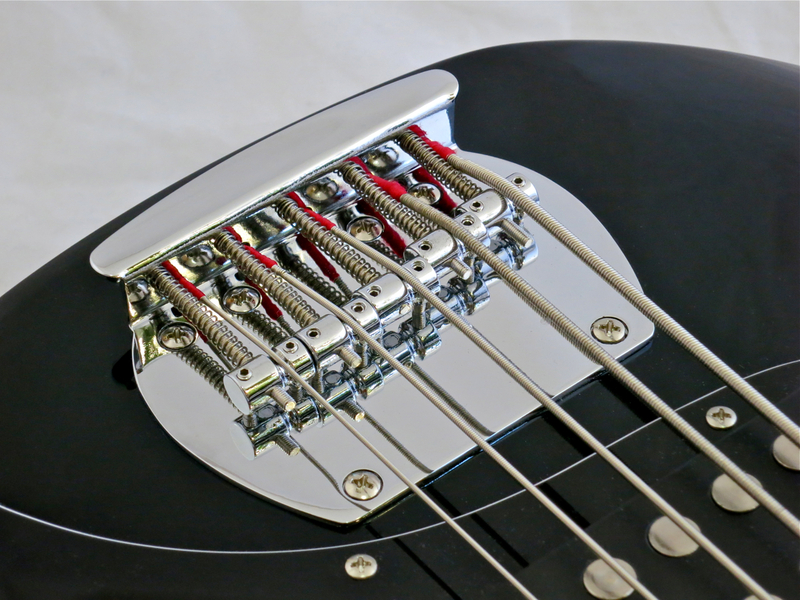 The StingRay is one of my all-time favourite bass designs – timeless, classic beauty. On the five-string the bridge saddles are somewhat smaller to accommodate the SUB Ray5’s narrower string spacing (compared to the Ray4). 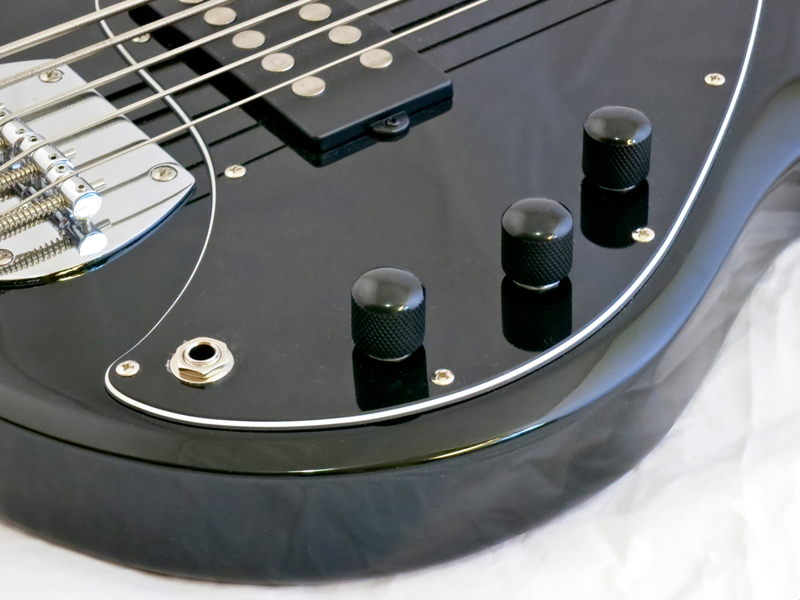 A genuine Music Man StingRay 5 usually comes equipped with a three-way blade switch, offering you series, parallel and coil-split switching, in addition to a three-band EQ. To keep the price in check the Sterling SUB Ray5 offers you a more concise set of controls – a master volume and a two-band EQ. 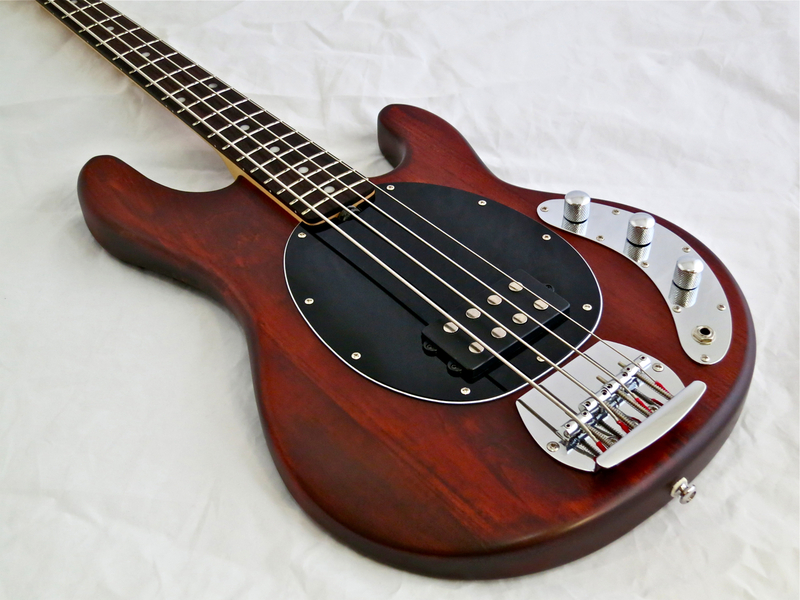 The Sterling SUB Ray4 is a cool bass, but the test sample we got weighed a ton – this is exactly the one feature from the 1970s that shouldn’t have been brough back. On the other hand, Sterling promise lightweight bodies on their website, so let’s hope that this was the one who slipped through quality control. Apart from this, the Sterling Ray4’s ergonomics are great. Sterling have slightly changed the neck profile on its SUB-basses from the original, somewhat chunkier Precision-style profile, giving you a more tapered, Jazz-type shape. Thanks to the good fretwork the factory set-up was comfortably low (E: 2,1 mm/ g: 1,9 mm). Regardless of its weighty body (or because of the added heft?) the SUB Ray4’s acoustic delivery is stonking. I don’t know what wood species the body is, but the sound has a hefty dose of clear attack coupled with a good dose of ash-style growl and clarity! This tasty combination translates into a very powerful and dynamic amplified tone. Sterling’s preamp displays a satisfying lack of hiss, and all of its controls work in a musical way (in fact better than on some, quite drastic-sounding 70s originals). This means you’re in for a real treat – genuine StingRay-character made very affordable. 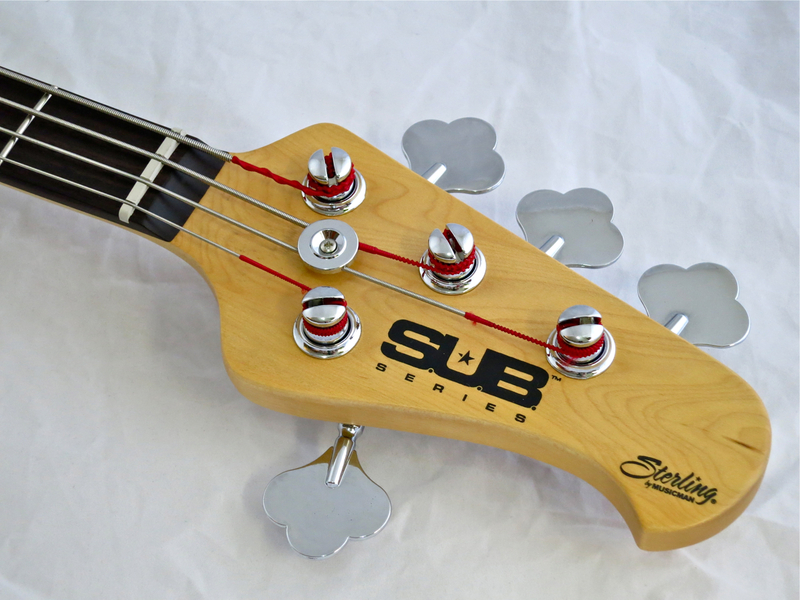 For a five-string bass our Sterling SUB Ray5 test instrument was refreshingly lightweight! 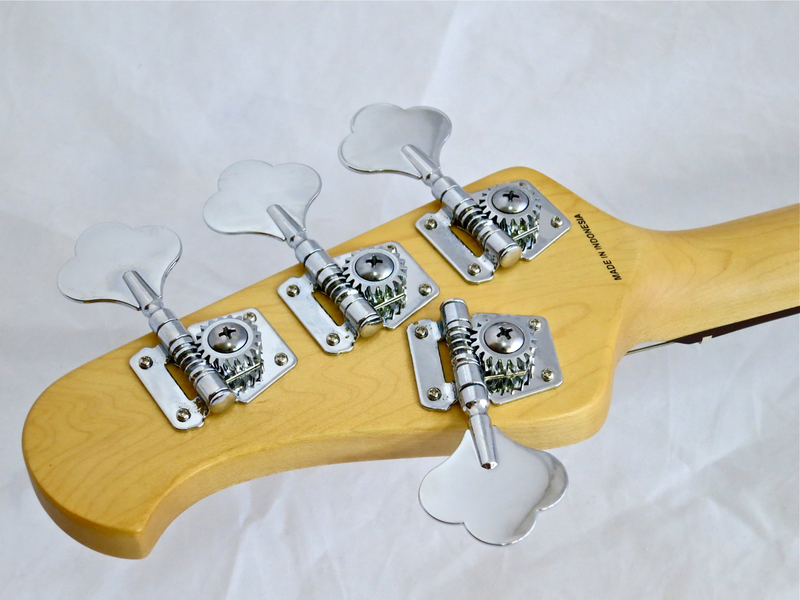 Just like on the original the Ray5’s neck profile gives your fretting hand something to hold on to. The rounded, moderately chunky D-profile is good news for the tone of the instrument, and it feels great, at least in my hands. I had to give the neck a little more relief, and the intonation adjustment was off, too. But it only took me a couple of minutes to get this bass’ action and intonation up to snuff, after which the SUB Ray5 was a joy to play and listen to (low-B: 2,6 mm/g: 1,9 mm). The big-sounding humbucker coupled to the instrument’s very decent preamp makes for a winning combination. The tone is pure Music Man – a fat, but precise bottom end, lots of mid-range character, and a dose of treble zing. It may not be as versatile as its famous big cousin, but the Sterling SUB Ray5 gives you most of the Music Man-experience at a pocket-friendly price. 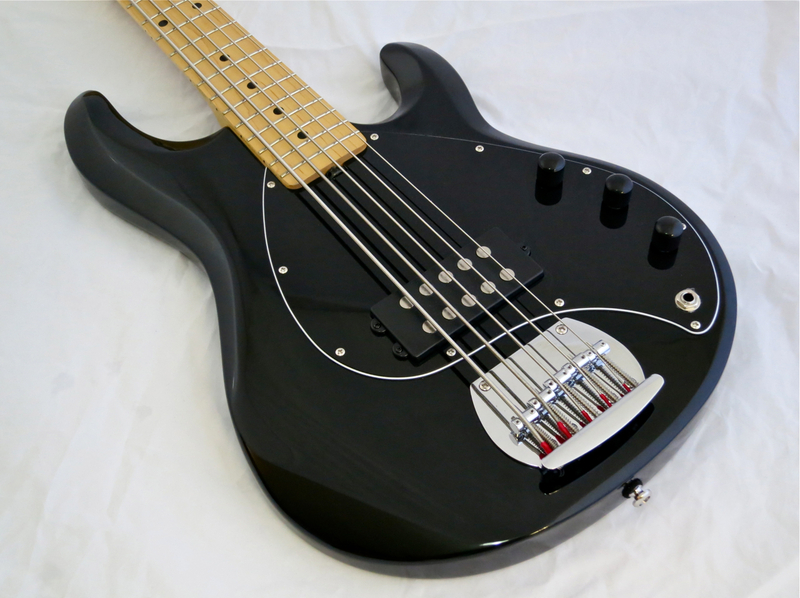 Sterling (by Music Man) have managed to pack a lot of bass into their SUB-series. The Ray4 and Ray5 are fantastic value for money, offering you that sound at very player-friendly prices. A big thank you to DLX Music Helsinki for the loan of the review samples! 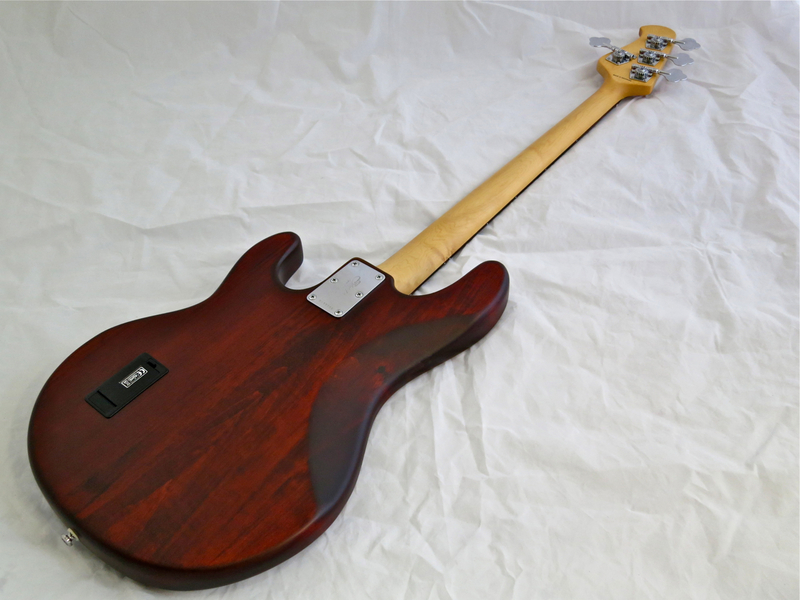 The wood they use on these sterling sub basses is called ”Jabon” its an indian wood that has tonal qualities of basswood.